The CSS Raleigh was a steam-powered ironclad ram, one of two Richmond-class ironclads built for the Confederate navy in Wilmington during the Civil War. Six Richmond-class vessels were laid down in Richmond, Wilmington, Charleston, and Savannah in the spring of 1862. Naval shipbuilder John L. Porter designed these ships for harbor defense, adapting plans that he had originally conceived in 1846. On 20 Apr. 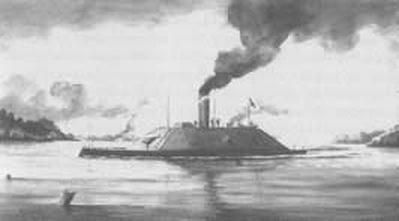 1864 the newly completed Raleigh steamed down the Cape Fear River and joined the ironclad North Carolina, which was already in service at Smithville. The Raleigh drew 13 feet of water, 6 inches less than the waterlogged North Carolina, and Flag Officer William F. Lynch quickly decided to take the new ironclad over the bar at New Inlet and attack the Union blockading squadron. The plan was ill conceived because the Richmond-class ironclads, intended for harbor defense, were unseaworthy. Nonetheless, the officers and men prepared the ship for combat. On the night of 6 May the Raleigh, accompanied by two small steamers, stood out into the Atlantic. The ensuing engagement was shrouded in darkness and marked by confusion. The Raleigh made contact with several Union vessels, but because of its slow speed, it was unable to close with them. Flares and gunfire alerted the rest of the blockading squadron, but most commanders, unaware of the ironclad's presence, assumed a blockade-runner had been cornered. For the rest of the night, the Raleigh steamed blindly through the blockading squadron, unnoticed by the Federals. At daybreak, the ironclad returned to New Inlet and crossed the bar at 7:15 a.m. The "battle" was over, neither side sustaining serious damage. After entering Cape Fear, the Raleigh turned south and soon ran aground on a bar known as "the Rip." As the tide went out, the weight of the casemate, guns, and machinery bore down on the stern of the ship. Unable to sustain the added weight, the Raleigh "broke her back," resulting in a total loss. Salvage crews saved the iron plating and guns and sent the boilers to the CSS Chattahoochee, then being repaired at Columbus, Ga. Still, Iron Afloat: The Story of the Confederate Armorclads (1985). "Ironclad CSS Raleigh." Courtesy of Cape Fear Historical Institute. Available from http://www.cfhi.net/ColonelFWKerchner.php (accessed May 16, 2012). 1 January 2006 | Combs, Edwin L.